In the theology and cosmology of The Church of Jesus Christ of Latter-day Saints (LDS Church), there are three degrees of glory (alternatively, kingdoms of glory) which are the ultimate, eternal dwelling place for nearly all who lived on earth after they are resurrected from the spirit world. LDS Church members believe that the apostle Paul briefly described these degrees of glory in 1 Corinthians 15:40-42, and in 2 Corinthians 12:2. Joseph Smith elaborated on Paul's descriptions based primarily upon a vision he received with Sidney Rigdon in 1832 and recorded in Doctrine and Covenants (D&C) section 76. According to this vision, all people will be resurrected and, at the Final Judgment, will be assigned to one of three degrees of glory, called the celestial, terrestrial, and telestial kingdoms. A small number of individuals who commit the unpardonable sin will not receive a kingdom of glory, but will be banished to outer darkness with Satan where they will be "sons of Perdition". A vision given to the Prophet Joseph Smith and Sidney Rigdon, at Hiram, Ohio, February 16, 1832. Prefacing the record of this vision, Joseph Smith’s history states: "Upon my return from Amherst conference, I resumed the translation of the Scriptures. From sundry revelations which had been received, it was apparent that many important points touching the salvation of man had been taken from the Bible, or lost before it was compiled. It appeared self-evident from what truths were left, that if God rewarded every one according to the deeds done in the body the term 'Heaven,' as intended for the Saints' eternal home, must include more kingdoms than one. Accordingly, ... while translating St. John's Gospel, myself and Elder Rigdon saw the following vision." At the time this vision was given, the Prophet [Smith] was translating John 5:29. Assignment to a particular kingdom in the resurrection is contingent upon the desires and actions exhibited during mortal and post-mortal life. The LDS Church teaches that these different kingdoms are what Jesus was referring to when he said "[i]n my Father's house are many mansions" (John 14:2). Additionally, the LDS Church teaches that 1 Corinthians 15:40–41 speaks of these three degrees of glory, comparing them with the glory of the sun, moon, and stars. 10 And he saith unto me, Seal not the sayings of the prophecy of this book: for the time is at hand [final judgment]. 11 He that is unjust, let him be unjust still [telestial kingdom]: and he which is filthy, let him be filthy still [outer darkness]: and he that is righteous, let him be righteous still [terrestrial kingdom]: and he that is holy, let him be holy still [celestial kingdom]. "By 'many dwelling-places' (John 14:2) the Savior meant the differing stages of spiritual ascent and states of development in the other world; for although the kingdom of heaven is one, there are many different levels within it. That is to say, there is place for both heavenly and earthy men (cf. 1 Cor. 15:48) according to their virtue, their knowledge and the degree of deification that they have attained. 'For there is one glory of the sun, and another glory of the moon, and another glory of the stars, for one star differs from another star in glory' (1 Cor. 15:41); and yet all of them shine in a single divine firmament." "Just as many lamps may be lit from the same oil and from a single light, and yet often do not give out an equal radiance, so the gifts that come from different virtues reflect the light of the Holy Spirit in different ways. Or as the many inhabitants of a single city all use bread and water, though some of them are men, some infants, some children, some old people, and there is a great variety and difference among them; or as wheat sown in the same field may bear dissimilar ears of corn, though they are all brought to the same threshing-floor and stored in the same barn: so it seems to me that in the resurrection of the dead different degrees of glory will be distinguished and recognized among those who are resurrected, depending on the level of virtue they have attained and the extent of their participation during this present life in the Holy Spirit that already dwells within them. This is the significance of the phrase, 'Star differs from star in glory" (1 Cor. 15:41)." The celestial kingdom is the highest of the three degrees of glory. It is thought by the LDS Church to be the "third heaven" referred to by the apostle Paul in the King James Version of 2 Corinthians 12:2 and it is said to correspond to the "celestial bodies" and "glory of the sun" mentioned in 1 Corinthians 15:40–41. The celestial kingdom will be the residence of those who have been righteous, accepted the teachings of Jesus Christ, and made and lived up to all of the required ordinances and covenants. Individuals may accept and receive these ordinances and covenants during their mortal lives. For those who did not have the opportunity while living, they will have the opportunity in the post-mortal spirit world, where they can accept ordinances performed on their behalf by LDS Church members in temples. All children who die before the age of eight automatically inherit the celestial kingdom without the reception of ordinances. The celestial kingdom is the permanent residence of God the Father and Jesus Christ. Joseph Smith taught that "a white stone is given to each of those who come into the celestial kingdom, whereon is a new name written, which no man knoweth save he that receiveth it." This white stone will become a Urim and Thummim (or seer stone) to the recipient. Smith taught that the celestial kingdom itself is subdivided into three "heavens or degrees". Only those individuals who are sealed in celestial marriage to a spouse will be permitted to enter into the highest degree of celestial kingdom. These individuals will eventually become "exalted" It is believed that this cannot be comprehended in the world; rather, it is said that the learning and understanding of salvation and exaltation will occur even beyond the grave. Like other ordinances, the sealing to a spouse may occur during mortal life or may be accepted by the parties in the afterlife and performed by proxy in a temple. The nature of the lower two degrees within the celestial kingdom have not been described, except to say that the people who go there will become "ministering angels". Smith also taught that the earth will also receive a celestial glory. Some church members believe that the earth will become the celestial kingdom. The terrestrial kingdom is the middle of the three degrees of glory. It is believed by LDS Church members to correspond to the "bodies terrestrial" and "glory of the moon" mentioned by the apostle Paul in the King James Version translation of 1 Corinthians 15:40-41 15:40–41. The word "terrestrial" derives from a Latin word meaning "earthly". According to D&C section 76, those who will inhabit the terrestrial kingdom include those who lived respectably but "were blinded by the craftiness of men" and thus rejected the fullness of the gospel of Jesus Christ when it was presented to them during their mortal lives. It also includes persons who rejected the "testimony of Jesus in the flesh, but afterwards received it" in the spirit world and those who "are not valiant in the testimony of Jesus" after having received it. Ultimately, the kingdom of glory (either the celestial or the terrestrial) received by those who accept the testimony of Jesus will be based on God's knowledge of whether they "would have received it with all their hearts" as manifested by their works and the "desire of their hearts". Those who inherit the terrestrial kingdom "receive of the presence of the Son, but not the fulness of the Father." Smith taught that translated beings abide in the terrestrial kingdom until they are judged at the Final Judgment, after which they will enter into the celestial kingdom. The telestial kingdom is the lowest of the three degrees of glory. It is believed by LDS Church members to correspond to the "glory of the stars" mentioned by the apostle Paul in the King James Version translation of 1 Corinthians 15:41. There are no known uses of the word "telestial" prior to its use by Smith. According to the D&C, those who will inhabit the telestial kingdom include those "who received not the gospel of Christ, nor the testimony of Jesus." It will also include "liars, and sorcerers, and adulterers, and whoremongers, and whosoever loves and makes a lie." Because of their refusal to accept Jesus as their Savior, these individuals will remain in spirit prison for 1,000 years during the millennial reign of Christ. After the 1000 years, the individuals will be resurrected and receive an immortal physical body and be assigned to the telestial kingdom. Smith taught that individuals in the telestial kingdom will be servants of God, but "where God and Christ dwell they cannot come, worlds without end"; however, they will receive the ministration of the Holy Ghost and beings from the terrestrial kingdom. Despite these limitations, in LDS Church theology being resident in the telestial kingdom is not an unpleasant experience: "the glory of the telestial ... surpasses all understanding". Smith also taught that just as there are different degrees of glory within the celestial kingdom (D&C 131:1–4), there are different degrees of glory within the telestial kingdom. He stated that "as one star differs from another star in glory, even so differs one from another in the telestial world." In the telestial kingdom, each person's glory will vary depending on their works while on the earth. Smith and Rigdon stated, "we saw the glory and the inhabitants of the telestial world, that they were as innumerable as the stars in the firmament of heaven, or as the sand upon the seashore". One Latter-day Saint commentator has suggested that by implication this means that "most of the adult people who have lived from the day of Adam to the present time will go to the telestial kingdom." 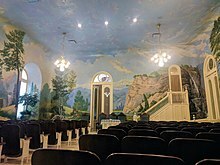 During the original endowment temple ordinance, church members moved between ordinance rooms that represented the three different kingdoms of glory. In most newer LDS temples, the majority of the moves between rooms have been replaced with changes in lighting to represent changes from one degree of glory to the next. In some of the church's older temples (e.g., the Salt Lake, Manti Utah, and Cardston Alberta temples), the classic version of the endowment ceremony is still done by moving from room to room. Every LDS temple includes a celestial room—representing the celestial kingdom—that is separate from the other ordinance rooms. Some—including Mormon historian D. Michael Quinn in his book Early Mormonism and the Magic World View—have argued that various parts of the Mormon plan of salvation were influenced in part by Emanuel Swedenborg's book Heaven and Hell. In Heaven and Hell, Swedenborg wrote that "[t]here are three heavens" that are "entirely distinct from each other." Swedenborg called the highest heaven "the Celestial Kingdom." He also stated that the inhabitants of the three heavens corresponded to the "sun, moon and stars." While some historians believe Smith was familiar with Swedenborg's theology at least by 1839, others have argued that he did not have access to the writings of Swedenborg. One of Smith's preeminent biographers has argued it is more likely that Smith and Swedenborg developed their ideas independently based on 1 Corinthians chapter 15. ^ History of the Church 1:24–52. ^ St. Nikodemos of the Holy Mountain and St. Makarios of Corinth. Philokalia - The Complete Text (Kindle Locations 28432-28440). ^ St. Nikodemos of the Holy Mountain and St. Makarios of Corinth. Philokalia - The Complete Text (Kindle Locations 22659-22672), Vol. 3, pg. 300. ^ Joseph Smith, Joseph Fielding Smith (ed.) (1976). Teachings of the Prophet Joseph Smith (Salt Lake City, Utah: Deseret Book) p. 309: "All men who become heirs of God and joint heirs with Jesus Christ will have to receive the fulness of the ordinances of his kingdom; and those who will not receive all the ordinances will come short of the fulness of that glory"; see also p. 362, where Smith said that without temple ordinances "we cannot obtain celestial thrones." ^ Doctrine and Covenants 137:5–9. ^ Doctrine and Covenants 76:62. ^ Doctrine and Covenants 130:11. ^ Doctrine and Covenants 130:10. ^ Doctrine and Covenants 131:1. ^ Doctrine and Covenants 131:2–4. ^ Joseph Smith, Joseph Fielding Smith (ed.) (1976). Teachings of the Prophet Joseph Smith (Salt Lake City, Utah: Deseret Book) p. 348: "It will be a great while after you have [died] before you will have learned [all the principles of exaltation]. ^ "Chapter 47: Exaltation", Gospel Principles, pp. 275–80. ^ Doctrine and Covenants 132:16–17. ^ Joseph Smith, Joseph Fielding Smith (ed.) (1976). Teachings of the Prophet Joseph Smith (Salt Lake City, Utah: Deseret Book) p. 181: "This earth will be rolled back into the presence of God, and crowned with celestial glory." ^ Doctrine and Covenants 88:14–26. ^ Doctrine and Covenants 76:75. ^ Doctrine and Covenants 76:74. ^ Doctrine and Covenants 76:79. ^ Doctrine and Covenants 137:8–9. ^ Doctrine and Covenants 76:77. ^ Joseph Smith, Joseph Fielding Smith (ed.) (1976). Teachings of the Prophet Joseph Smith (Salt Lake City, Utah: Deseret Book) p. 170: "Many have supposed that the doctrine of translation was a doctrine whereby men were taken immediately into the presence of God, and into an eternal fulness, but this is a mistaken idea. Their place of habitation is that of the terrestrial order". ^ Doctrine and Covenants 76:82. ^ Doctrine and Covenants 76:103; see also Revelation 22:15. ^ Doctrine and Covenants 76:84, 105–06; "Chapter 46: The Final Judgment", Gospel Principles, p. 294. ^ Doctrine and Covenants 76:112. ^ Doctrine and Covenants 76:86. ^ Doctrine and Covenants 76:89. ^ Doctrine and Covenants 76:98; see also 1 Corinthians 15:41. ^ Doctrine and Covenants 76:109–11; see also Bruce R. McConkie (1966). Mormon Doctrine (Salt Lake City, Utah: Bookcraft) p. 778–79. ^ Doctrine and Covenants 76:109. ^ Bruce R. McConkie (1966). Mormon Doctrine (Salt Lake City, Utah: Bookcraft) p. 778. ^ a b Emanuel Swedenborg, "Heaven and its Wonders and Hell From Things Heard and Seen". ISBN 0-87785-476-9 (2001 translation) and ISBN 0-85448-054-4 (1958 translation). ^ Hamblin, William J. "That Old Black Magic." FARMS Review 12.2 (2000): 225-394. The Neal A. Maxwell Institute for Religious Scholarship. 1 December 2009. ^ Richard Lyman Bushman, Joseph Smith: Rough Stone Rolling (New York: Alfred A. Knopf, 2005), p. 198–99. This page was last edited on 22 April 2019, at 00:51 (UTC).